Dr. Allen Hunt often pictures brown pelicans when he thinks about evangelization. 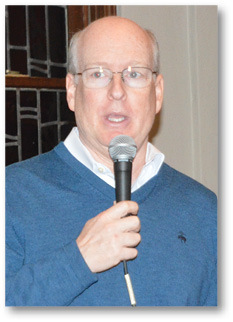 In a talk before a standing room only crowd at Christ the King Church and Catholic Center in Baton Rouge on Jan. 17, he drew comparisons between the seabirds’ plight to the challenges facing the Catholic faith. Hunt was a manager of a Wall Street consulting firm before he felt the call to ministry, first as a pastor of a mega church before he stepped down to convert to Catholicism and later become vice-president of Dynamic Catholic Institute. During Hunt’s consulting years, the Chamber of Commerce of Monterey, California contacted him because the brown pelicans, its main tourism draw, were dying off. The team studying the problem called in a pelicanologist, who said when the fishing industry was robust, the pelicans poached fish off the boats. Because of overfishing, the fishing industry shrunk, and with fewer boats coming in, the pelican population dwindled. “The pelicans poached so much they forgot how to fish,” said Allen. One solution was to introduce a healthy population of pelicans from other areas to teach the local ones how to fish. Similarly, the American Catholic churches struggle as the “boats they enjoyed feasting from” during the past 100 years have declined, such as the larger numbers of immigrants from primarily Catholic countries, the higher birth rate of children being born into Catholic families and a people entering Catholic Church through their marriage to a Catholic spouse. “I’m afraid that as Catholics in America in the last 100 years we’ve forgot how to fish,” said Hunt. The Catholic Church “didn’t really know what evangelization is,” Allen said, so it studied it and researched it, but were still puzzled about its meaning. “We overthink it. We overcomplicate it and become intimidated by it,” said Hunt. A majority said, ‘Oh, no, thank you. I’m Catholic, we do not do that,” Hunt said wryly. Many Catholics, according to Hunt, think evangelization means “standing outside an LSU ballgame and yelling at people with a megaphone and handing out tracts. Once Catholics realize God loves them it changes them from the inside out, Hunt emphasized. “It’s a joy you can’t contain. It’s not a passive feeling. You’re so happy to share it with everyone,” said Hunt. He stressed if people want more of something they have to give it a way. Even in today’s digital world, evangelization can mean giving something tangible, such as a CD or book, or asking someone how they are doing and inviting them to go to Mass. In this dark, broken, hungry culture the best thing Catholics can give is love and hospitality, noted Hunt. Issuing a Lenten challenge, Hunt urged attendees to pray for someone who creates difficulty in their lives, as well as invite someone to attend Mass with them. “I can’t guarantee that at the end of 40 days what that person will do, but I guarantee you will have changed,” said Hunt.